The Toronto Maple Leafs announced today that the hockey club has signed goaltender Joseph Woll to a three-year entry-level contract. 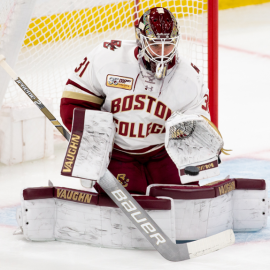 Woll, 20, appeared in 37 games with Boston College this season posting a 13-21-3 record and .919 save percentage. In 101 games with Boston College, the Dardenne Prairie, MO native holds a 2.51 goals-against average and a .919 save percentage. Internationally, Woll has represented the United States on multiple occasions, most recently capturing bronze at the 2018 IIHF World Junior Championship and gold at the 2017 IIHF World Junior Championship. Woll was selected by the Leafs in the third round (62nd overall) of the 2016 NHL Draft.